Alex Johnson, Ph.D., is president of Cuyahoga Community College (Tri-C®). From meager beginnings, he has carved out a distinguished record of accomplishments. His 40 years in higher education ― 25 as a college president ― provide a unique perspective universally applicable to leaders and are represented in his new book, Change the Lapel Pin. Johnson has constructed a leadership model based on education, experiences and exposures. Change the Lapel Pin is designed to help you uncover these "Three Essentials of Leadership" and hone your natural abilities. It will help you quickly establish skills and competencies such as the capacity to transform the culture of an organization, look and act like a leader, recognize and eliminate challenges, and provide for your ongoing development as well as that of your colleagues. 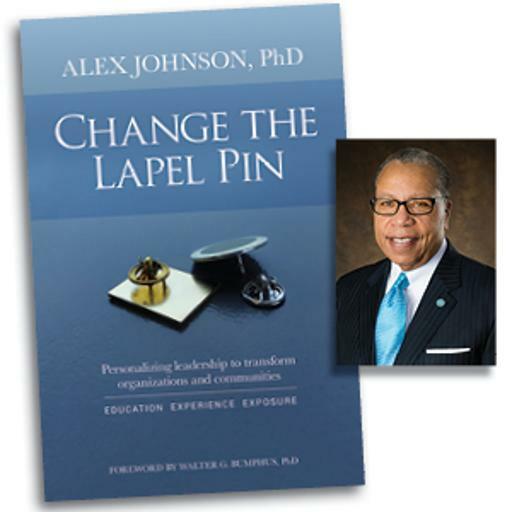 Change the Lapel Pin provides a window into Johnson’s soul through an examination of his own achievements as a college president as well as the contributions of such business icons as Steve Jobs, Jeff Bezos and Howard Schultz ― whose exemplary leadership propelled Apple, Amazon and Starbucks to unprecedented levels. Johnson’s book introduces a paradigm shift in how leadership originates. Rather than being developed from without, it is rooted from within. This, he says, is the truest, most natural form of leadership: dependable, reliable and consistent. It gets you closer to the people who do the work ― both personally and structurally. In short, the wisdom captured in Change the Lapel Pin will help you and your organization transform communities and lives. "Dr. Johnson does an outstanding job of introducing a philosophy of leadership that comes from within, personalized from a blend of education, experience and exposure. Included, too, are applicable competencies and skills learned before and during the job. Applying natural talent when leading and the ability to address change through innovative practices round out the approach." Books can be purchased for $24.95 at any Cuyahoga Community College bookstore location or online. Proceeds from the book will go toward student scholarships through the Cuyahoga Community College Foundation Gap Scholarship Fund. The fund benefits students who need financial aid but do not qualify for federal or state assistance. Purchase "Change the Lapel Pin"